It is time to Free up iCloud Storage Space, in case your iPhone is reminding you about iCloud Storage space being full or nearing its capacity. 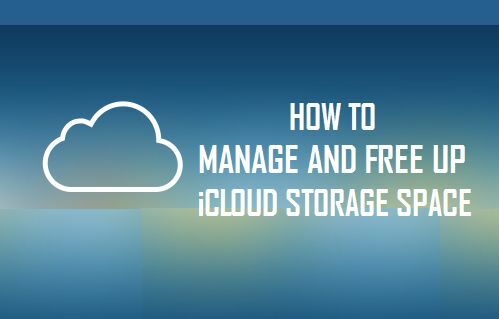 Hence, let us take a look at How to Manage and Free up iCloud Storage Space on your iPhone. Once iCloud Backup is setup on your iPhone, your device will automatically start backing up its data to iCloud. This transfer of Data and backup to iCloud happens over a WiFi network, whenever your Locked iPhone is connected to a power source and it is not being used. Typically, iCloud Backups include Device settings, App data, Messages, Notes, Voice Mail Passwords, Health data, Photos, Videos and more. The good thing about having all this data backed up to iCloud is that it makes it easy to restore your iPhone, in case you end up accidentally deleting or losing data on your iPhone or you want to setup a new iPhone using your existing data. Apple starts all iPhone, iPad, iPod and Mac users with 5 GB of free space on iCloud. However, you will soon end up using all your Free iCloud storage space, as your device starts backing up its data to iCloud. When this happens, you can either purchase more iCloud Storage Space or Free up iCloud Storage space by deleting old backups and other unwanted data from iCloud. Even if you decide to go for more iCloud Storage Space, it is a good practice to properly Manage your iCloud Storage space by deleting unwanted iCloud Backups and other data from your iCloud Account. As long as you clearly understand as to what is included in an iCloud Backup and you have taken measures to backup your Photos and Data to a computer, you will have no problem deleting iCloud Backups and other unwanted data from your iCloud Account. For example, you can transfer Photos from iPhone to Mac or Windows PC and then safely delete all the Photos and Videos in your iCloud Account. Extending this concept further, you can backup your iPhone to computer using iTunes and then free up storage space in your iCloud Account by deleting the Backup of your iPhone on iCloud. Unknown to you, your iCloud Account may also contain Backups from your old iPhone which you no longer use or contain Backups from your Mac or iPad which you do not really need. In such cases, you can delete all the unwanted backups and Free up iCloud storage space. 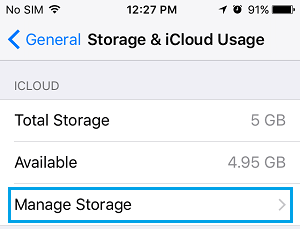 In case you are getting pop-ups on your iPhone, informing you that your iCloud storage is getting full, you can either upgrade your iCloud Storage Plan or make efforts to free up iCloud Storage Space by taking any/all of the following measures. 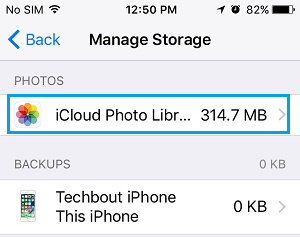 Let us now take a look at the exact steps to free up iCloud Storage Space on your iPhone. As mentioned above, you can backup your iPhone to Computer using iTunes and then safely delete the iCloud Backup of your iPhone by following the steps below. 2. On the Settings screen, scroll down and tap on General. 3. On the next screen, tap on Storage & iCloud Usage. 4. 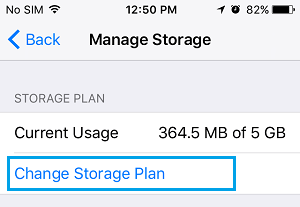 On the Storage & iCloud Usage screen, tap on the Manage Storage option, located under “iCloud” section (See image below). 5. On the Manage Storage screen, tap on your iPhone located under “Backups” section. 6. 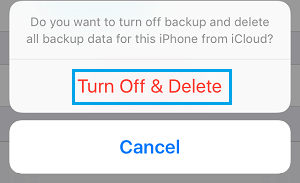 On the next screen, scroll down to the bottom of the screen and tap on Delete Backup (See image below). 7. You will see a pop-up, tap on Turn OFF & Delete. This will delete the back up of your iPhone on iCloud and also Turn OFF iCloud backup. Make sure that you Turn ON iCloud Backups back again on your iPhone after you are done freeing up iCloud storage space. You will find that Photos & Videos will be taking up the most storage space on your iCloud Account. 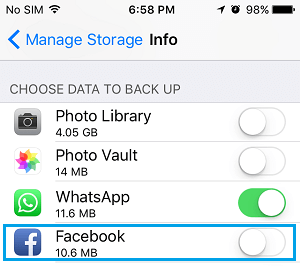 Hence, you should be able to free up a lot of iCloud Storage space by deleting Photos & Videos from iCloud Backups. Before deleting Photos & Videos from iCloud, you may want to transfer Photos from iPhone to Mac or Windows Computer. 1. Tap on Settings > General > Storage & iCloud Usage. 2. On the next screen, tap on Manage Storage option located under “iCloud” section. 3. 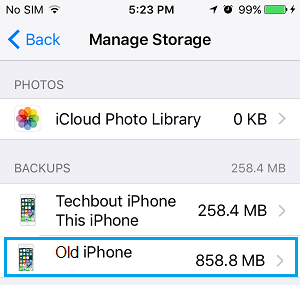 On the Manage Storage screen, tap on iCloud Photo Library option located under Photos section. 4. On the next screen, scroll down and tap on Disable & Delete. 5. You will see a Pop-up, tap on Turn Off & Delete option to Delete all your Photos on iCloud. This will delete all the Photos from iPhone stored on your iCloud Account. Apple will keep these Photos on its servers for a period of 30 days. 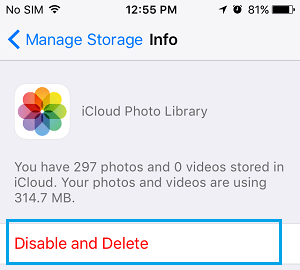 Within this period, you can Undo the Delete and get all your Photos back on iCloud. In case you find backups from your old iPhone or other devices in your iCloud Account, you can delete all such unwanted backups by following the steps below. 2. On the next screen, tap on Manage Storage option located under iCloud section. 3. 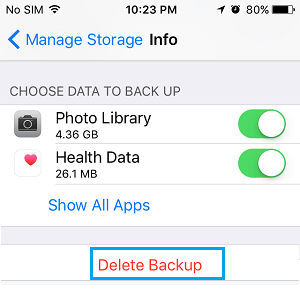 On the Manage Storage screen, tap on the iCloud backup of the device that you want to delete (See image below). 4. On the next screen, scroll down to the bottom and tap on Delete Backup. 5. Next you will see a pop-up, tap on Turn Off & Delete. This will delete all the Data from this device from your iCloud Account. You may come across a number of apps backing up data to your iCloud Account. You can delete all such unwanted App Data and prevent those apps from backing up to iCloud by following the steps below. 3. On the Manage Storage screen, tap on your iPhone located under Backups section. 5. You will see a pop-up, tap on Turn Off & Delete. This will delete all App Data on iCloud Stored by the App and will also prevent the App from storing data on iCloud. In case you want to avoid the hassle of freeing up iCloud Storage space from time to time, you can buy more storage space for iCloud Backups by following the steps below. 3. On the Manage storage screen, tap on Change Storage Plan. 4. On the next screen, tap on the Storage Plan that you want to go for. As you can see, iCloud Storage is not that expensive and it helps you protect your iPhone’s data and Photos from getting lost, in case something goes wrong with your iPhone.